Teenagers are notorious for their high boredom threshold and now that were well into the school holidays that threshold is often reached. Unless there is constant entertainment, or a posse of friends about, they seem to go into a mope crying “im bored” like all they’ve done all summer is sit on their own doing nothing. I begin to feel old as I wonder about the youth of today. Whatever happened to self entertainment and the pursuit of solitary activities like book reading, diary writing, drawing, cooking, sewing? Maybe I am just old!! Actually, my teen is beginning to rediscover the joy gained from at least some of these things. She has become a bit of a bookworm lately and has started writing a journal (although claims she would only be truly inspired if she lived in the eclectic surroundings of London!!). She also enjoys a bit of cooking, as long as it is to her specification. Today in search of a bit of excitement she insisted she make everyone a proper afternoon tea. I wasn’t going to argue. I like to think that her sudden longing for the perfect afternoon tea harks back to her younger days, where hoards of teddy bears sat around cups and plates enjoying their imaginary goodies. The tea she made tea today was a more adult affair with a careful attention to detail. Perfect vintage in every respect…cups and saucers, steaming tea-pot, delicate milk jug and delicious home-made scones served with my strawberry and red currant jam and loads of clotted cream. She set the table, arranged the chairs taking great care that the crockery matched and then told me firmly to sit and eat. I didn’t take much persuasion. 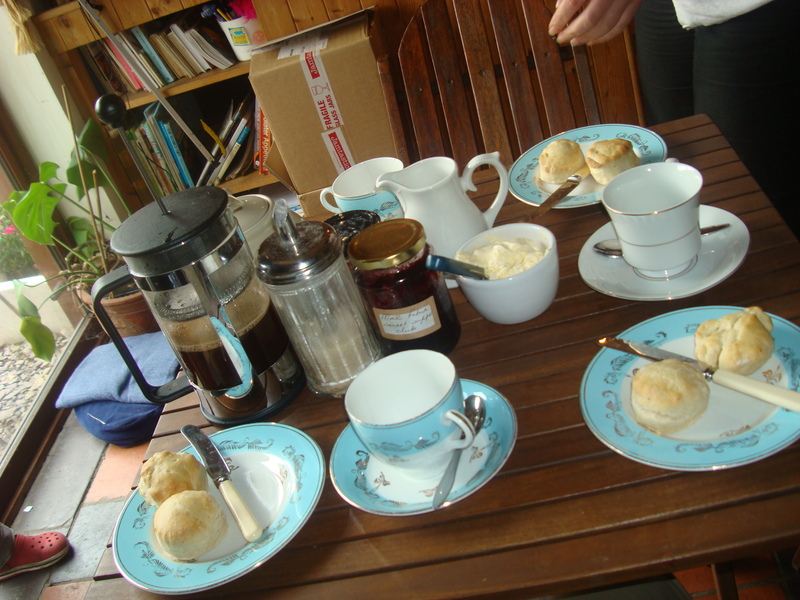 It was a lovely intimate girly moment of decadence as we polished off three scones each and took some time to chat and giggle over her grumpy little brother who refused to join us. I love these moments, so rare at her age that I relish each one. I only wish she was so good at tidying up afterwards!! 1 teaspoon baking powder, 1 teaspoon cream of tartar, 1 teaspoon caster sugar and a pinch of salt. Enough milk to make a soft dough. Sieve flour into a bowl and rub in the butter. Add remaining ingredients and enough milk to make a soft dough. Roll out to a thickness of about 1 inch. Cut into small rounds. It should make about 12 scones. Bake in a hot oven gas mark 7, 220 degrees for about 10 minutes or until nicely browned on top. 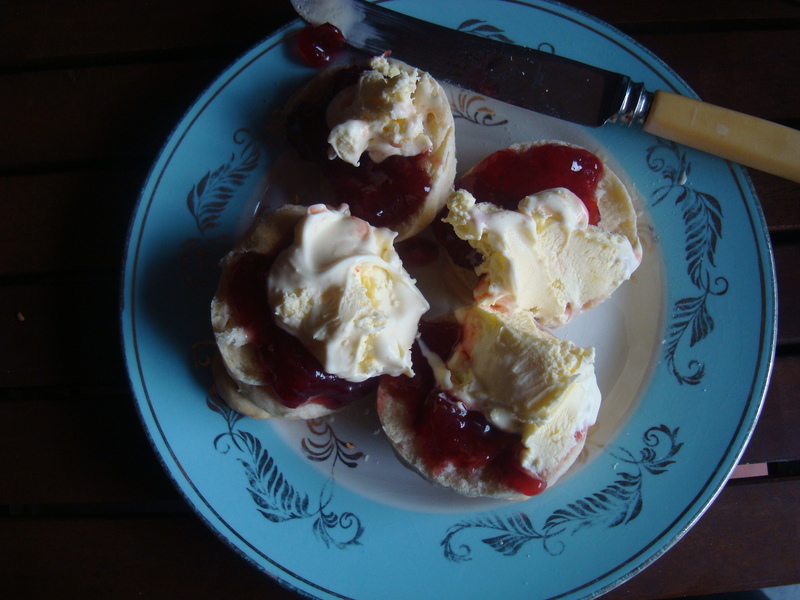 Serve with lashings of jam and cream (clotted preferably).